Unfinished Person needed a win to keep their playoff hopes alive and were looking good with a six-point lead and Jennings on MNF. But Gronk was happy to disappoint, with 28 freaking fantasy points. So this week I face the intimidating Bald Spots. And I brought in the most intimidating ever, badass fictional character ever for this one. 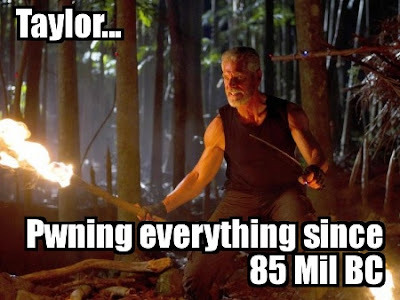 Yup, none other than Taylor, the kickass leader on the show Terra Nova. That picture was taken right before the moment he stared down a giant lizard dinosaur with just that torch and a knife. Last week, the guy deflected a meteor blast with his chest. Taylor's tears could cure cancer. But he never cries. And he helps me beat Bald Spots this week.